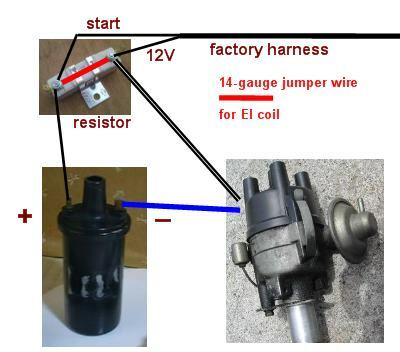 Electronic Ignition Conversion - Factory Datsun "matchbox"
Replace your points-based distributor with a High Energy electronic ignition using the 1979-up USA Datsun factory "matchbox" distributor. This is the Hitachi D4K distributor for four-cylinder engines and Hitachi D6K for six-cylinder engines. D4K or D6K is stamped on the distributor body. * No more replacing of you points & condensor on scheduled 12 months/15000 miles. NOTE: Earlier factory Datsun systems used a "remote ignitor" system (Hitachi D4F). The Matchbox discussed here is a cleaner setup using only two wires and no external box. If you really want to the use the 1974-1978 system, use the search box. IMPORTANT: These are similar but different to non-Matchbox distributors. With the matching items, the swap is very easy. Without the matching items, you will need to do additional modifications. CAUTION: These often go bad after 20 years. Inspect carefully before buying. The good news is the electronics almost never go bad! Look for the matchbox bolted to the side of the distributor. Look on the distributor body. The type is stamped on it: (e.g. D410, D4K, D4F, D4N etc). D4K or D6K is the matchbox type. Wipe away the grease to see the stamped numbers. It also has the Nissan part number (starts with 22100). Remove old distributor, Insert new distributor. Rotate the housing to align the teeth of the new distributor. Ensure rotor is pointing to the #1 position on the cap. On the L-series engine, you must ensure the matchbox unit is not facing the exhaust manifold. Overheating is a sure way to cook the box. By using the matching Support Pedestal and timing plate it will fit in the correct way. The condensor is optional, it is to reduce radio interference. One end goes to coil+, the other to ground. Optional (but highly recommended) is to run a dedicated ground wire from the body of the distributor to bare engine metal (such as to a timing cover bolt). If you got the matching high-energy coil, then you can jump the ballast resistor (connect a 14 gauge wire across both terminals of the resistor) to enable high-energy mode. Alternatively you can remove the Ballast Resistor and connect all three wires together. 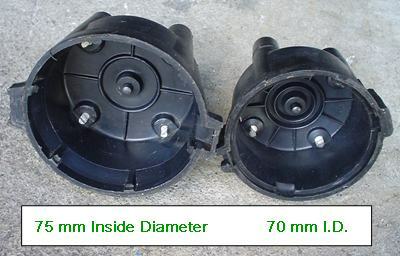 You can re-use your 1975-1978 distributor Cap & Rotor (75mm inside diameter). For older distributors with 70mm cap, get the matching used Cap & Rotor for the Matchbox system. You can buy new, but genuine Nissan 75mm cap & rotor almost never go bad. Matchbox D4K uses the same 75mm cap as earlier D4A/D4F distributors. The smaller cap is used by 1960s/early 1970s distributors (e.g. D40, D411 and D412). Matchbox with its matching coil works fine with points-type spark plug gap (.031 to .035 inch), but also can reliably fire larger gaps -- which fire lean mixtures better. Use 0.039 to 0.43 reliably for all Datsun engines. Higher gaps are possible (see the late model repair manual for specific recommendations which work with certain engines). If using a points coil with a resistor, set the gap to 0.35 inch. 1. Make sure the 'teeth' line up evenly, evenly spaced (gap is equal with all four). Also wiggle the teeth with your finger. If you use a tool, you can get them all to move, but it shouldn't move with your fingers and in any case should snap back to perfect teeth gap alignment. 2. Check vacuum advance -- most are bad! -- bring a vacuum gun with you and ensure that vacuum stays steady (does not slowly leak) and that it rotates the advance plate. A stuck advance plate is the result of bad plate bearings (see point #1). The good news is you can buy a new can for $30 to $100 from RockAuto.com or other local parts stores. 3. Wiggle the shaft from side to side. It should have no or a tiny bit of play. If it has enough to allow the stator teeth to hit the reluctor teeth, that's way too much. That being said, the shaft bushings rarely wear out. About the teeth alignment: most of the used Matchbox distributors I have purchased have this problem. In the photo, note the mis-alignment of the reluctor. It is caused by a bad "breaker plate" assembly (vacuum-advance plate), which you cannot see without disassembly the distributor. In some of the distributors you can see ball bearings loose in the housing. In the others I couldn't see, but they are all broken. That's the problem, the BBs are held in by a plastic race. Nissan have new breaker plates, but they are a $72 part. So I have a accel coil on it now.so I eliminate the ballast resistor wit the new dizzy? I have the s/plug gap @.032 at the moment wit point condenser. Ballast. .032 inch is fine and works with any ignition system. If you have an Accel coil suitable for a points distributor, it probably won't work without a resistor (not without overheating after some time). When you get the "new dizzy" also get the matching high-energy coil that goes with it (see post #1 above). For most Datsuns that is Nissan part number 22433-H7285 or 22433-H7280 or equivalent. It is a hotter coil than an Accel points-type coil. If you really love the Accel yellow look coil, I'm sure they sell one which is compatible (contact them and ask). The Accel coil won't make any more HP than the Nissan matchbox coil. Get the matching high-energy coil that goes with the matchbox distributor. 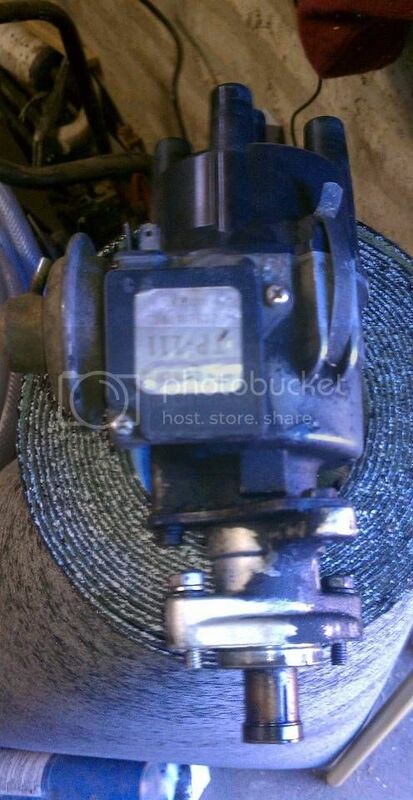 For example, if you get an L20B distributor from a 1979-1980 Datsun Pickup, get the coil that goes with it too. From any local auto parts store. From Nissan. Or from RockAuto.com. Ask for a "1979 Datsun Pickup coil". 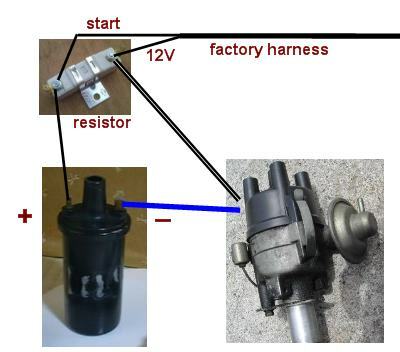 Or if you get an A14 distributor from a 1979-1982 Datsun 210, get the matching coil too. Or buy it from any local auto parts store. From Nissan. Or from RockAuto.com. Ask for a "1979 Datsun 210 coil". There is no need to buy a "Blaster" coil, a "GT" coil or any other aftermarket "performance" coil. The Nissan unit is a high performance, high-energy coil, suitable for built engines, and good for 7000 RPM use (and higher RPM on a four cylinder). I think I followed the wrong wiring diagram when I replaced my dual points distributor for an electronic dizzy style. Am I supposed to use the resistor? You have to run the dropping resistor if you keep the old coil. This will prevent it over heating and possibly burning out. If you get a '78 and up coil from a 620, 200sx or HL510 it is designed to work with the EI dizzy and can handle the extra current. The extra current gives a greater output voltage to the plugs... so you can take advantahe of this by increasing the plug gaps to between 0.038-0.042". Does the timing have to be advanced when switching from points to El dizzy? why would it? it doesnt know if its a points or a elelctric ignition when the coil fires. it just signals to fire. However depending on the dissy curve you have you might want tio find the sweet spot for your vehicle. Just an FYI.. I replaced a stock '80 Matchbox dizzy with a "Cardone" one from Advance Auto Parts. This distributor DID HAVE an OEM HITACHI spark box on it. If you choose to go the new route and you want the bulletproof Hitachi spark box, this brand might be the way to go.. This is especially true due to the very pricey advance plate replacement part. Thank you much for this write-up! I just did this to my '76 620. The donor vehicle was a '80 720. I'm not so good with electrical stuff but this thread made the process less intimidating. There was a difference in the wire colors coming off the matchbox distributor; the one you have labeled as blue was white. But your pics made it easy to figure out. My truck starts and runs great. Once again, thanks! I did this to all my 510's way back the mid 90's. I did it in some fashion where I had to use the shaft from the stock distributor with some washer type shims because of the gear on the shaft of the electronic one. I believe I did a writeup for 510 Again back then. It took some figuring out but it has worked well all these years. Back then I did not have the info like there is today. If I can find the write up I did I will put a link to it. All I can say is it was like night and day after the change. The electronic one is so much better. If you DD your car with points you would want to check, file/adjust them at least twice a year, and then set the new timing of course. Been so long since I've changed them... I think with luck you can get almost 10K out of them? But in any case the points are constantly eroding down with use, with the dwell and timing changes, slight though they may be, constantly changing along with them. My '78 came with remote igniter, which is just a non miniaturized matchbox. There is a tendency to just drive the EI and forget about it... which I did for over 5 years when suddenly it failed to start with no warning. The carbon rod that make contact between the cap center electrode and the rotor had warn completely away. (I snipped a piece of fence wire and set it in there for the ride home) The point is that without points to inspect it easy to overlook the cap and rotor. I just found the write up of how I did this for my 510's in vol 7.9 of the 510 Again news letter. There is also a write up by Marc Sayer of performance eng In Vol 4.6 on how he did it with the same type electronic ignition distributor. I have to say I will NEVER MISS the points set up from befor, the electronic ignition distributor is the way to go for sure. I'm glad to find so much more info on this conversion. So far I have not had a lick of trouble, all has been fine. After looking at the info in the op, it looks like what I did was on a couple of my cars used a distributor from an A motor and did my mod to work on a L motor. At the time I did not know that. Can I use a gm ignitor with this distributor . Since my ignitor is fried? 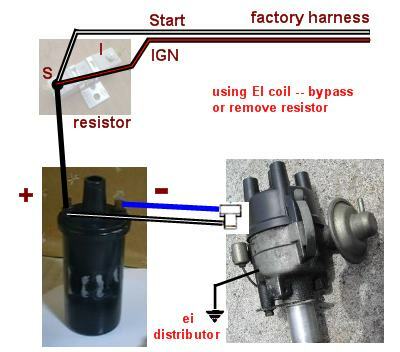 Replace your points-based distributor with a High Energy electronic ignition using the 1979-up USA Datsun factory "matchbox" distributor... On the L-series engine, you must ensure the matchbox unit is not facing the exhaust manifold. Overheating is a sure way to cook the box. By using the matching Support Pedestal and timing plate it will fit in the correct way. I have a problem. I think. Installing my matchbox diz and running out of light out there. I have a work light but I hate that scenario. ANYway, I read the how-to and it says don't cook the matchbox. I only have 1 option for mounting with the matchbox pedestal and that puts the matchbox near the exhaust manifold. If I spin it 180 the vacuum diaphragm (heh) hits the thermostat housing. Am I reading too much into it? I can see the old pedestal is at a slightly different clock position so maybe that puts the plastic box right on the mani? It looks like the right pedestal to me. Actually you can set the dizzy anywhere that places the vacuum advance and the matchbox safely out of the way, yet allows timing adjustment. Try one of the 90 degree positions. You will have to drop the spindle down and reposition it. I think there are twenty teeth on it so 20 possible positions.. not all are going to work obviously. You want the pedestal to match the engine, not necessarily the distributor. It looks like Z22 timing plate and L18 pedestal to me. 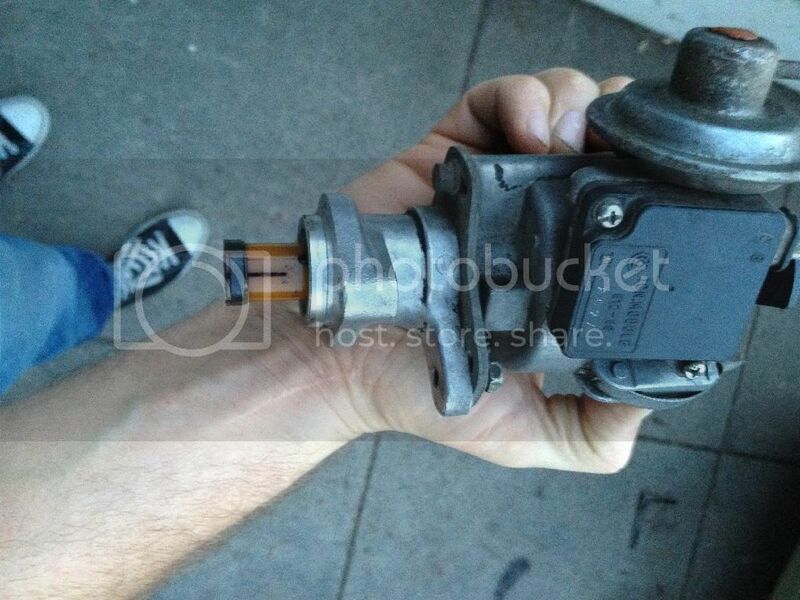 If so it will rotate the distributor incorrectly for any engine. Cars:1972 datsun 510, 1967 vw 21 window bus. It should connect exactly the same as a points dizzy. The dizzy type does not matter. Should you be asking how to wire an SSS tach? instead?? Well if you could post a diagram how to that would help also. I asked the other first as I was told it could not be used. ? ?